If you know what a golden sombrero, a worm burner and a meatball have in common, you must be an honest-to-goodness fan of baseball. Scott H. Longert understands. 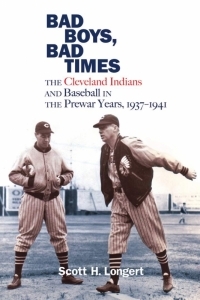 The author is visiting Lakewood Public Library on Thursday, April 11, 2019 at 7:00 p.m. to discuss the game as it was played by the Cleveland Indians in the years leading up to World War II as outlined in his new book, "Bad Boys, Bad Times: The Cleveland Indians and Baseball in the Prewar Years, 1937-1941." To say Scott Longert is a baseball fan doesn’t quite cut the stadium mustard. As a little boy, he learned to read by trying to understand baseball box scores. In college, his graduate research paper was on the early twentieth century baseball player, Tris Speaker and over the last thirty years he has written four books on baseball history: "King of the Pitchers" (1999), "The Best They Could Be" (2013), "No Money, No Beer, No Pennants" (2016) and "Bad Boys, Bad Times: The Cleveland Indians and Baseball in the Prewar Years" (2019). Through it all, he has been watching, following, contemplating and cheering for, baseball. His latest book, "Bad Boys, Bad Times" describes the personalities and behind the scenes drama from the years 1937-1941. There were dugout fights, player discontent, the Cry Baby incident, bats thrown into the stands, injuries and general mayhem all around. The event takes place in the Main Lower Level Auditorium where books will be available for sale and signing.